This production by Lost Dog dance theatre company is a total re-working of the Romeo and Juliet legend. In this contemporary version, the couple survive their experiences in the vault. Neither commits suicide, instead, they run away and get married, have a child and live happily ever after. Or do they? In fact, the world's most famous lovers are having a crisis. They've tried every therapy under the sun and still aren't getting on. So they are attempting another idea, reliving some of the scenes from their lives together in front of the audience. By re-examining their past they hope to improve their future. The cracks are immediately obvious as Juliet talks over Romeo and he just looks on glumly. But they are not giving up yet. And so we see famous scenes from Shakespeare's play recreated, changed and given new meanings and interpretations while we also see totally new narratives from their lives following the supposed end of their stories. In place of doomed romance, we now find a level of ordinariness as they argue over childcare and shopping – the classical has become the mundane. But the show also plays games with that classic story. When a stranger arrives one evening and Romeo 'over-shares' his story, he is somewhat surprised to find it recreated by William Shakespeare as Romeo and Juliet. And while the real Juliet loves this fictionalised account, Romeo finds it a burden he can't bear. There are some moments of real beauty such as when Romeo first sees Juliet and there's also a very dry humour. After Romeo intricately recreates that first meeting, there's a pause before Juliet dismisses it, saying she doesn't remember it being quite like that. The couple also have very different experiences and memories of their near death scene in the vault. Peppered among the humour is a sadness as we see the little disappointments, the unrealised hopes and expectations and the deceptions which make up their modern marriage. By delving into the private lives of the most famous lovers of all, Lost Dog are saying such experiences can be universal. But they are not without hope. Romeo and Juliet are still trying to make their love work. 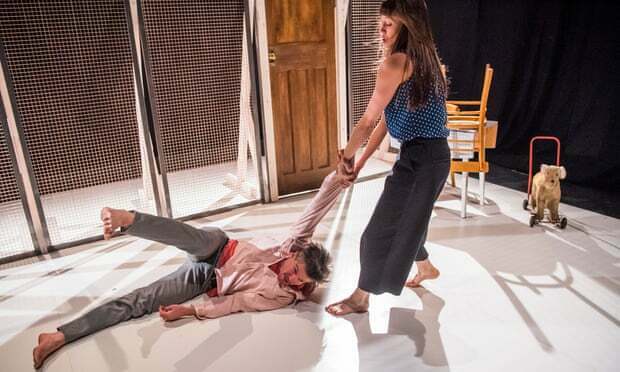 Both Ben Duke, who conceived and directed the production, and his co-performer Solene Weinachter bring humour, pathos and vulnerability to their roles. Whether speaking, moving or dancing, they have a subtle connection – even when they are highlighting the disconnection between their two characters. Presented by Birmingham's DanceXchange and performed at the Patrick Studio in Birmingham Hippodrome, this is a show which will make you smile but also crack your heart.